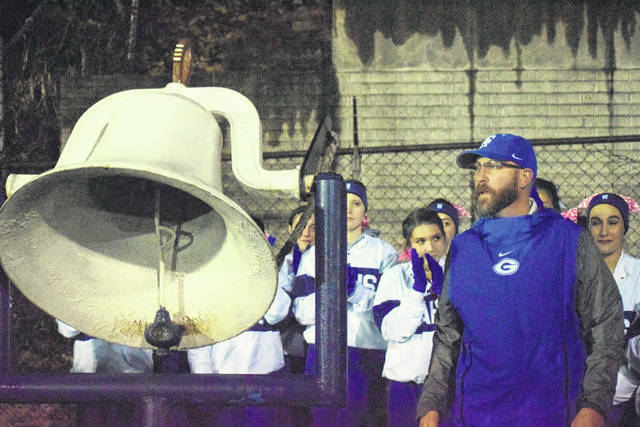 Second-year GAHS football coach Alex Penrod talks to the home crowd by the victory bell Friday night after the Blue Devils defeated South Point for the program’s first-ever OVC championship at Memorial Field in Gallipolis, Ohio. 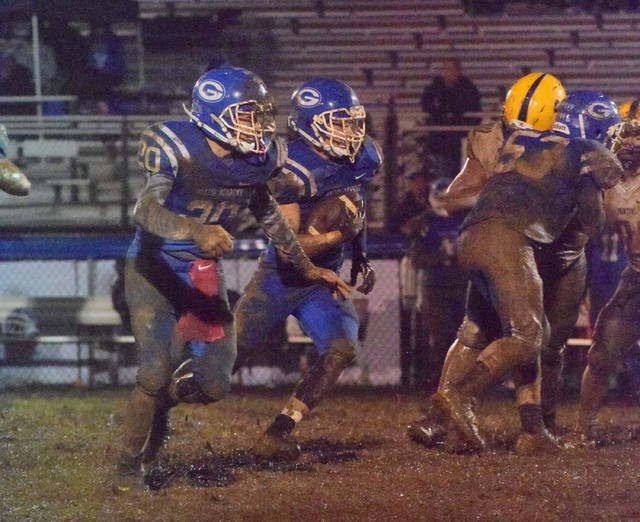 GALLIPOLIS, Ohio — This muddy mess never looked — or felt — so good. Gallia Academy scored all of its point by halftime and limited visiting South Point to just 48 yards of total offense en route to wrapping up the program’s first outright Ohio Valley Conference championship on Friday night with a 44-0 Week 10 triumph at a soggy Memorial Field in the Old French City. The host Blue Devils (9-1, 7-0 OVC) needed just 13 offensive snaps to build a 28-point first quarter advantage, thanks in large part to an opportunistic defense that forced consecutive fumble recoveries on the Pointers’ first two possessions. The Blue and Gold (0-10, 0-7), conversely, had negative 13 yards of offense on 10 plays over their first four drives, and the guests mustered their first first down with just over three minutes remaining in the opening stanza. The Blue Devils ultimately scored touchdowns on their first five offensive drives, then added a safety and an ensuing punt return in a 14-second time span that gave the hosts a 44-point cushion with 7:13 left in the first half. SPHS strung together a 13-play drive over the remaining seven-plus minutes of the second frame, but never came closer than the Gallia Academy 32-yard line before time ran out. At the break, the Blue Devils held an 8-4 edge in first downs and were plus-2 in turnover differential. South Point also had all three punts of the game in the opening 24 minutes of play. The hosts held a 203-23 advantage in total yards of offense, including a 160-22 cushion in the ground attack. From there, both teams agreed to play eight-minute quarters in the second half — with the clock also continually running due to the 30-point advantage. Gallia Academy claimed a small 52-20 edge in yards after halftime, but the guests had two of the three first downs beyond the intermission. The Blue Devils secured the program’s 18th league championship in football overall, as well as an 11th playoff berth. Both feats were last accomplished as members of the Southeastern Ohio Athletic League back in 2012. The Blue and White became the highest-scoring football team in school history after posting at least 34 points in each of their nine victories this fall. Gallia Academy also earned its second shutout of the 2018 campaign. Afterwards, second-year GAHS coach Alex Penrod spoke about the importance of winning this game — despite playing a program that has now dropped 18 consecutive decisions. As he noted, it was a good measuring stick for how focused his troops were on the task at hand. And, he wasn’t disappointed with what he witnessed. The Blue Devils already had their first turnover of the night three plays into the game as Trentin Waller scooped up a fumble at the SPHS five with 10:24 showing in the first. Gallia Academy covered that distance two plays later as Lane Pullins bulled his way in with a 3-yard run. Jacob Campbell added a successful 2-point conversion run, giving the hosts an 8-0 lead at the 9:53 mark of the first. The Pointers fumbled the ball away on the ensuing kickoff as Trenton Johnson recovered the ball for GAHS at the guests’ 18-yard line with 9:41 showing. Three plays and 18 yards later, Justin McClelland scrambled 17 yards after recovering a fumbled snap and walked into the end zone for a 14-point cushion. McClelland found James Armstrong on a successful 2-point conversion pass at the 9:07 mark, making it a 16-0 contest. The Blue Devils forced a three-and-out, then marched 60 yards in seven plays as Campbell rumbled in from seven yards out at the 5:25 mark for a 22-0 advantage. South Point again had a three-and-out before punting, then Pullins needed only one handoff to cover the 49-yard distance for a 28-0 edge with 3:39 remaining in the opening period. After forcing the Pointers’ final punt late in the first, the Blue Devils strung together an 8-play, 69-yard drive that ended with a 43-yard TD pass from McClelland to Cory Call on fourth-and-8. Cade Roberts hauled in the successful 2-point conversion pass from Call at the 9:26 mark for a 36-point cushion. A pair of bad snaps inside the South Point 20 cost the guests two points when Alex Lambert was sacked in the end zone, as the safety gave GAHS a 38-0 lead with 7:27 left until halftime. James Armstrong fielded the ensuing SPHS punt at his own 42, then weaved his way through defenders to take it to the house for a score. Just 14 seconds had elapsed, but the Blue Devils ultimately completed their scoring with Armstrong’s 58-yard punt return at the 7:13 mark of the second canto. Gallia Academy finished the night with a 9-6 edge in first downs and outgained the guests by a sizable 255-48 margin in total yards of offense. The hosts were also flagged for two penalties for 20 yards, while SPHS had one penalty for a single yard. Campbell led the Blue and White with 78 rushing yards on eight carries, followed by Michael Beasy with 71 yards on five totes. Pullins also added 58 yards on four attempts. McClelland was 1-of-4 passing for 43 yards, with Call hauling in the lone reception. Trent Meadows also recorded the team’s lone solo sack. Kionte Bacon paced the Pointers with 44 rushing yards on 10 carries. Lambert was 2-of-8 passing for one yard, with JoJo Burris accounting for that single yard on one catch. The Blue and Gold had 17 offensive plays that resulted in either no gain or negative yardage, with a dozen of those resulting in lost ground. The Blue Devils — who have won nine consecutive OVC contests — now turn their sights on next Saturday night as the Blue and White will be hosting somebody in the Division IV, Region 15 playoffs at Memorial Field. The kickoff is scheduled for 7 p.m.
Penrod wants the players, coaches and community to enjoy this first-ever OVC championship, but the postseason is what really separates great teams from good teams — and Penrod believes that these Blue Devils are a special football group. Given some of the things that Gallia Academy has learned about itself this fall, Penrod believes that his team is ready for the next task in front of it. “It’s special to finally get back to Week 11, and we know that the competition level is going to be different from here on out. Hopefully we are tested, but most importantly we will be prepared. We’ll be ready to play in front of the home crowd next week and hopefully keep this season moving forward,” Penrod said. “When you get into that second season, it’s one and done. Our kids remember the feeling from that Jackson game in Week 3 and how much they didn’t enjoy it. You never know when it’s your last game, so the most important thing now is that next play. Now it’s about giving everything you have because you don’t know if that next game or next play is coming.